What are the differences in Flying Fisherman's Acutint™ lens color options? What are UV rays, and do Flying Fisherman® sunglasses provide UVA & UVB protection? How many different lens materials do you offer? How do I clean my Flying Fisherman® sunglasses? 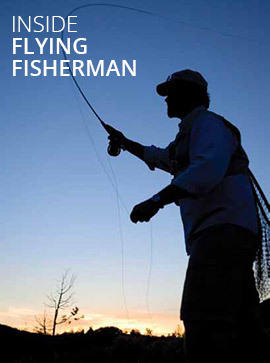 What other products does Flying Fisherman® offer besides sunglasses? Polarization is a process that uses special filters to absorb glare producing light waves reflected off horizontal surfaces. This horizontally polarized light is blocked by the vertically oriented polarizing filters in the lenses. The result: a significant reduction in annoying and sometimes dangerous glare. Vermillion - A copper/rose lens tint favored for sight fishing, muddy water and very low light conditions. Maximum sharpness and color definition. Ultraviolet (UV) rays are located just past the violet portion of the visible light spectrum; sunlight is the main source. UV light is broken into three different types: UVA, UVB and UVC. UVA has longer wavelengths and passes through glass easily; experts disagree about whether or not UVA damages the eyes. UVB rays are the most dangerous, making sunglasses and sunscreen a must. UVC rays do not reach the earth because its atmosphere blocks them. Flying Fisherman® sunglasses provide maximum protection from harmful UVA & UVB rays, and meet or exceed FDA, ANSI and European (CE) standards for general purpose eyewear. Flying Fisherman® Sunglasses are offered in three durable lens materials. Polarized Ground & Polished Glass lenses are made of precision ground, optically flawless, ophthalmic glass. They are the most scratch resistant of any lens material, impact resistant and offer 100% UVA & UVB protection. 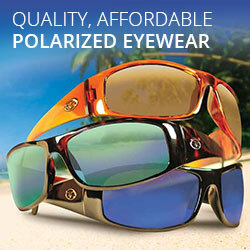 The AcuTint™ Polarized SunLens System eliminates glare. Polarized ground and polished glass lenses are offered in the Master Angler Series. Polarized Polycarbonate RhinoLenses™ are virtually indestructible. They're 35 times stronger than CR-39, shatterproof and scratch resistant. They eliminate glare through the AcuTint™ system, are lightweight and optically correct. 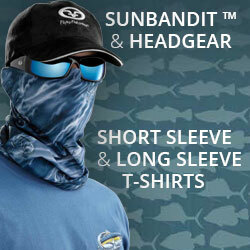 The RhinoLens™ offers 100% UVA & UVB protection, and can also be found in our Master Angler Series. Polarized Triacetate (TAC) lenses are lightweight and hard coated for scratch resistance. The Acutint™ Polarized SunLens system eliminates glare, and TAC lenses block 100% of UVA & UVB rays. TAC lenses are offered in our Action Angler Series and Clip-ons. Use fresh water and a soft cloth. DO NOT use lens cleaning solutions or other cleansers like Windex which cause the layers of the lens to separate and may damage lens coatings. 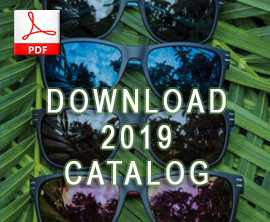 Flying Fisherman® has a range of eyewear accessories to protect your sunglasses, and a range of super comfortable t-shirts, hats and SunBandit™ bandanas to enhance your outdoor experience. And if you travel, you need a PASSPORT® -- check out the collection of fly rods and spinning rods for the global angler.